Come join us for a life-changing weekend of fun, friendship and focus. Make your reservations early. Each retreat allows just 6 students, and we sell-out fast! I realize that this looks difficult to do. It isn’t. It’s actually MUCH simpler than it looks. I’ve taught thousands of beginners using my method of a series of 6 individual steps, which when followed sequentially produce striking results. Every time. 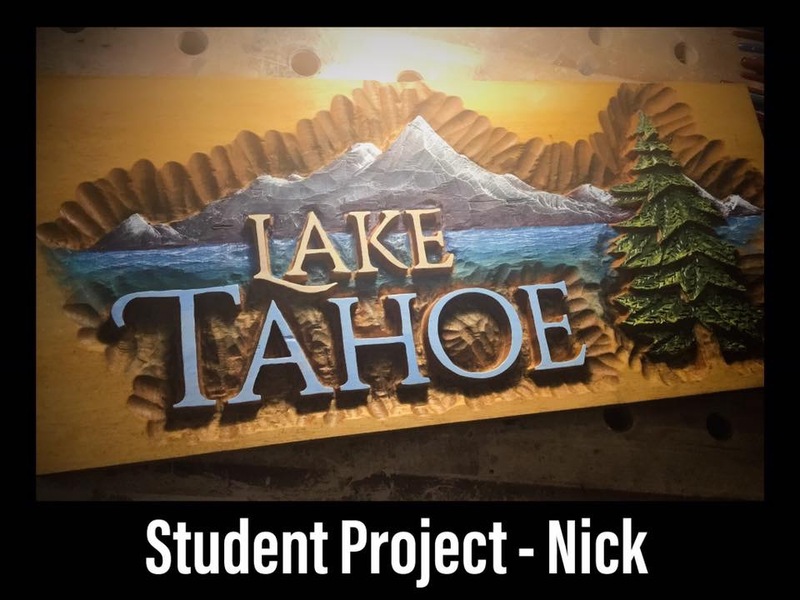 I’ve never had a student who wasn’t blown away with their project, the very first time. Ever. My teaching method involves both hand and power tools. Both have their place. We will walk through the steps together, one at a time. 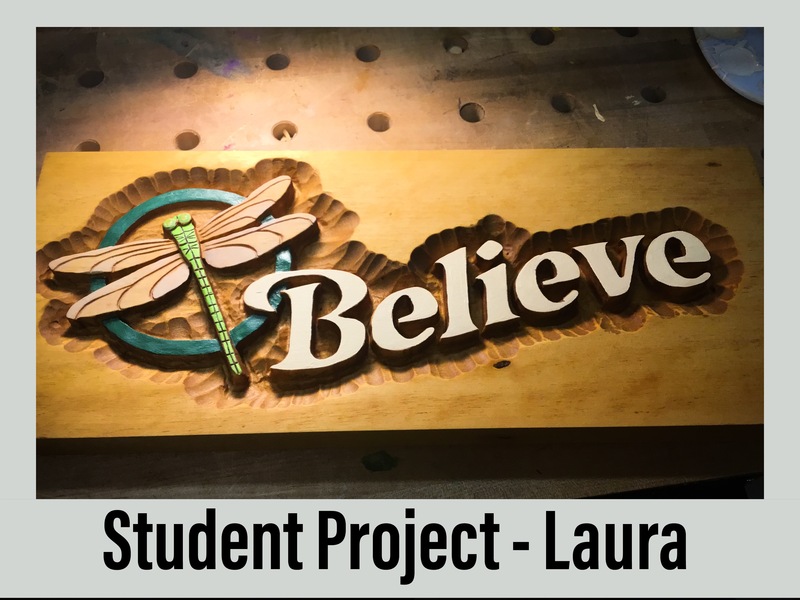 It doesn’t matter if I am carving a large Disney project or a small sign… I use the same 6-step method EVERY TIME. It’ll trip you out! You won’t believe what will come out of your hands at the end of the weekend! 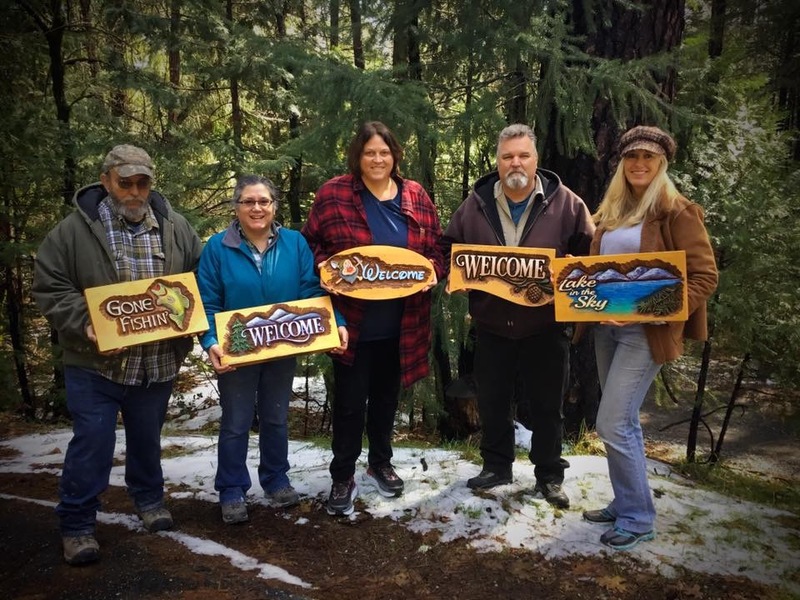 These retreats are hosted in my studio in Northern California (Grass Valley) nestled in the heart of California’s Sierra Mountain foothills. Historic Grass Valley and nearby Nevada City are amoung the most interesting of the 1849 California Gold Rush towns, attracting visitors from far and wide. Both towns are national historic landmarks, and there is much to see and do while visiting. Beautiful Lake Tahoe is about a 90 minute drive and San Francisco is about 2.5 hours away. Sacramento, California is the nearest international airport and is about 75 minutes from Grass Valley. Many students opt for the Airbnb option for lodging. It’s flexible and inexpensive. There are also several hotels and private cottages to choose from nearby. We are happy to help you find lodging which works for you. 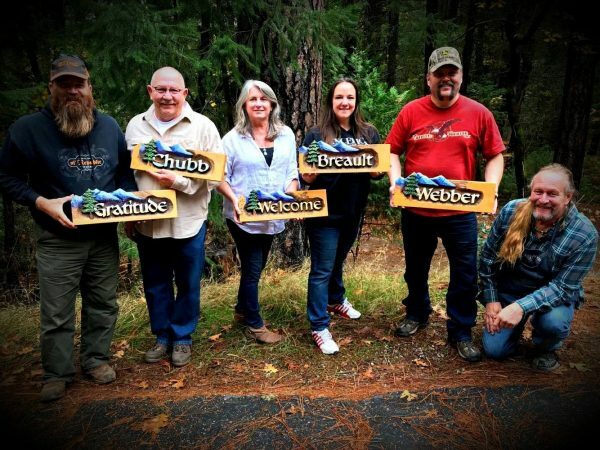 We schedule these retreats so that you can plan in advance. They typically sell out quickly after we publicly announce the dates, and availability can change quickly (but this website is updated as things change). The workshop (retreat) begins Friday evening at 5PM here in my studio. We will go as late as it takes to get our projects ready for the next day, usually about 5 hours. Saturday begins at 9AM and will continue as late as needed to prepare your project for the next day. Saturday is an intensive day and typically lasts 8 to 10 hours or so. You will be tired but satisfied at the end of Saturday! Sunday begins at 9AM and will continue as long as needed to complete your project. Typically 3 to 4 hours. Usually Sunday is free for travel or sightseeing. Our nearest airport is Sacramento, CA and is about 90 minutes from here. There is shuttle service available but a rental car will probably work best. Okay, Sounds great…. but what’s it cost? 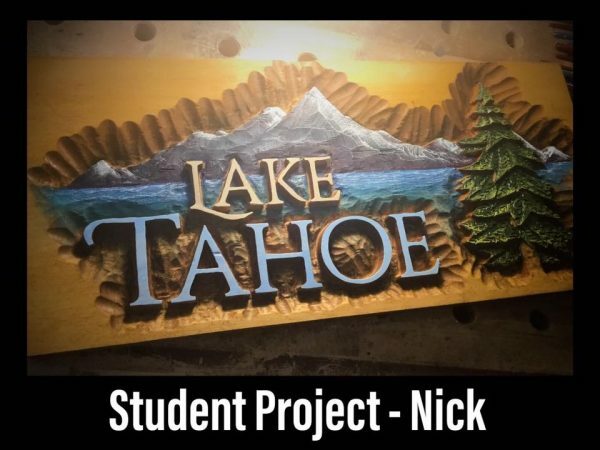 Each workshop (retreat) is limited to six students. The cost is $875 per person for all three days. For this price, you will go home with a custom made sign and 3 days of fun! All payments are non-refundable but may be used as credit in the event of unforseen circumstances which require you to reschedule. Accommodations are not included but there are tons of nearby options, as mentioned above! All tools and materials will be provided. Just. bring yourself and any personal favorite tool you wish, if you have some. If this is a gift for a loved one, we are happy to provide a beautiful customized gift certificate. For this, contact me directly. Check my page to see what my beginning students are doing… it’ll blow your mind! Thank you. Looking forward to seeing you at a retreat! The Weekend I spent at Raymond’s Retreat was very Educational and Relaxing. Raymond is an excellent teacher. You start off getting to know each other in Raymond’s home. After a short while you get right into it. I have never had relief art explained in the manner with which Raymond does. It’s a personal experience as well as a awareness to your everyday surroundings. You pick your own design and learn Layout. So right from the beginning it’s hands on and the excitement starts. 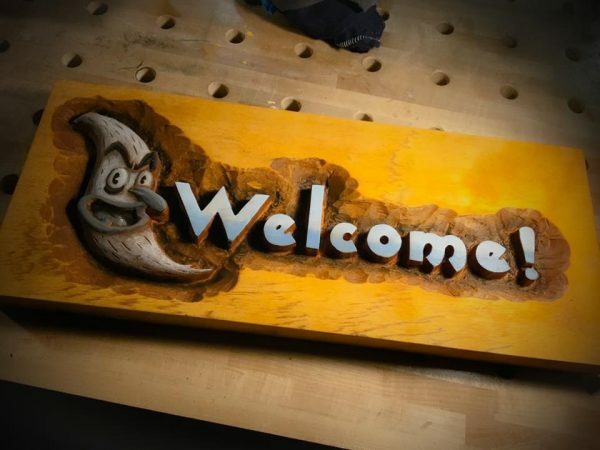 With Raymonds expertise he guides you through the steps and you carve and paint this beautiful Sign. Raymond uses the best tools, and materials and guides you to the finish line. It was a pleasure having you with us for the weekend, Eric! 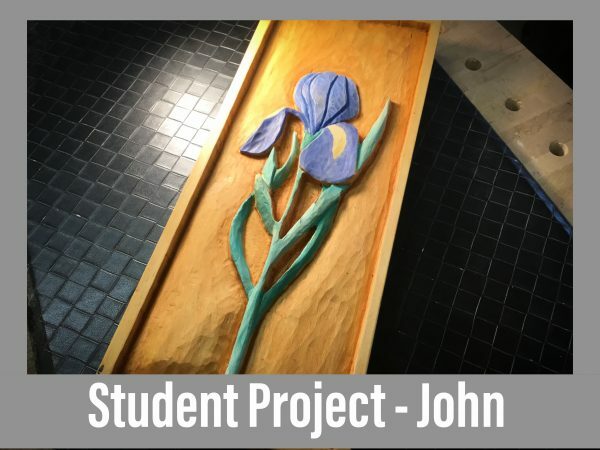 Your enthusiasm and positive attitude was contagious and your project was wonderful too! 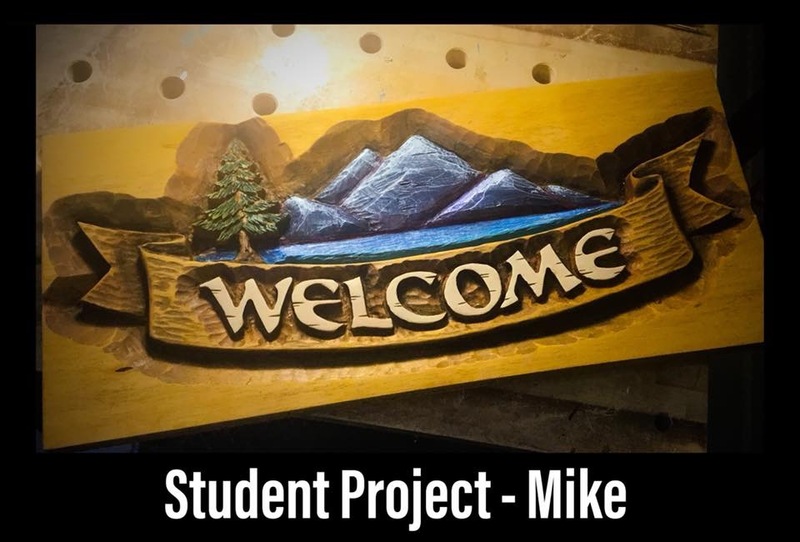 Thank you, Mike! Your project was just astonishing! 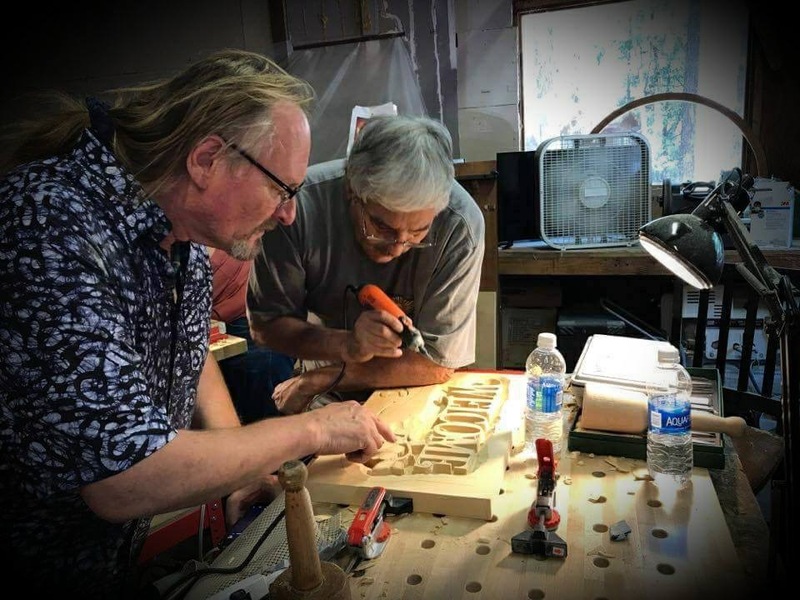 Great weekend with Ray, and met 5 other inspiring (beginner or no experience, me) carvers. WORTH the time, the piece you make is yours, and its unique, and Ray is a GREAT teacher, and I just cant say enough great things about this retreat. I’m paying attention and keeping an eye out for an intermediate or advance course in the future from Ray. MANY THANKS for this new skill. I can’t believe that I made this! 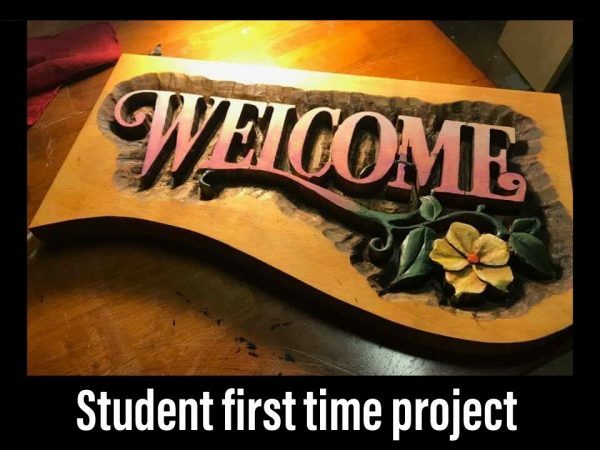 That’s what you’ll keep telling yourself, when you look at your finished project after attending Raymond Kinman’s beginning woodcarving class. Raymond is an amazingly talented artist and woodcarver and now I know he’s an equally talented teacher and coach. 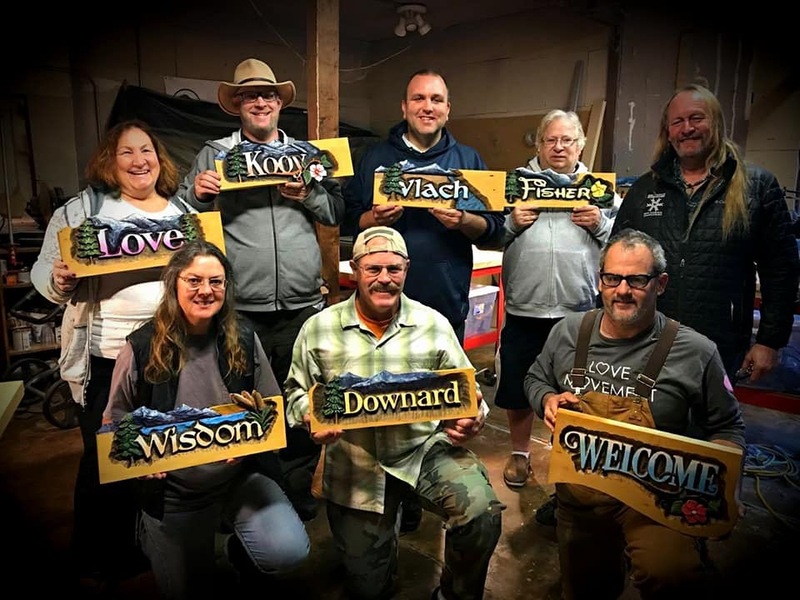 We had a wonderful 3 days of crafting our signs following Raymond’s tried and true woodcarving process and learning from his 40 plus years of woodcarving experience. We left each day feeling positive and proud at our progress. 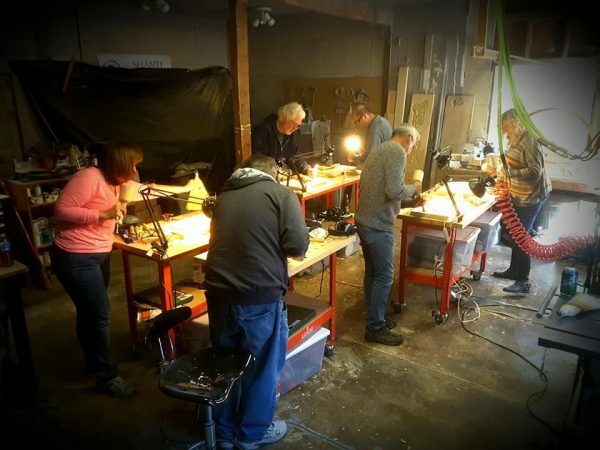 Raymond’s hands on guidance and small group format for the class made for an enjoyable and fun weekend of meeting other beginner woodcarving enthusiasts and created a positive and supportive learning environment. 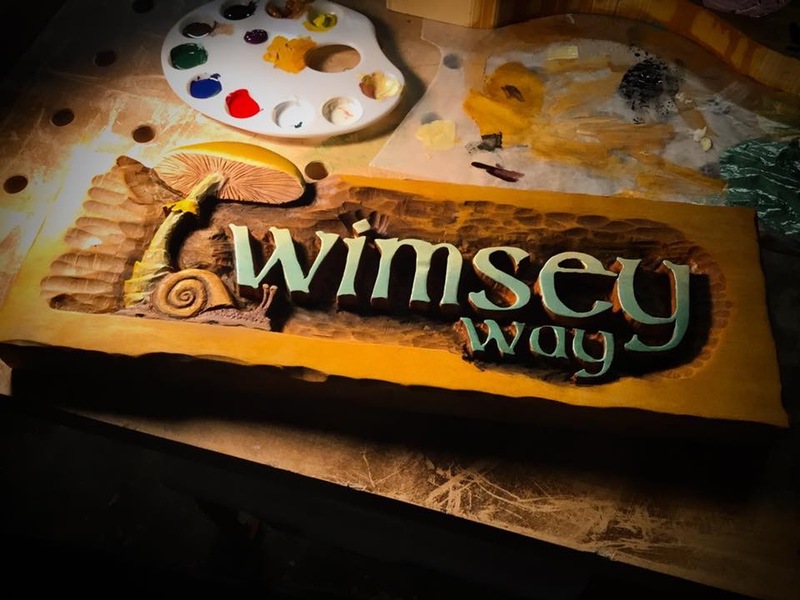 This workshop is a busy three days but so very rewarding and I’m thrilled with my project and new found knowledge, and I have a much better appreciation and understanding of woodcarving artistry. We loved this course!! 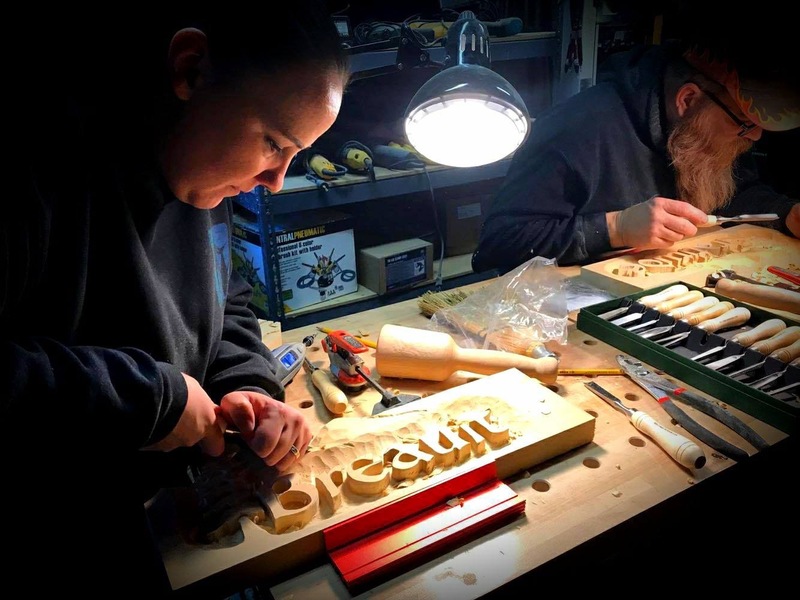 With no experience with relief carving, we ended the weekend with signs we are exceptionally proud of and a new passion for wood carving! Raymond’s individual attention and guidance turns a timid beginner into proud creator, I was so excited to do this course but my husband believed he couldn’t possibly carve let alone create something so beautiful. I love how confident he became each day and now we both have a new passion and respect for this craft. Raymond did that! The power of a great teacher. I can’t thank you enough for sharing your skills and knowledge with us. We are already planning our next project. 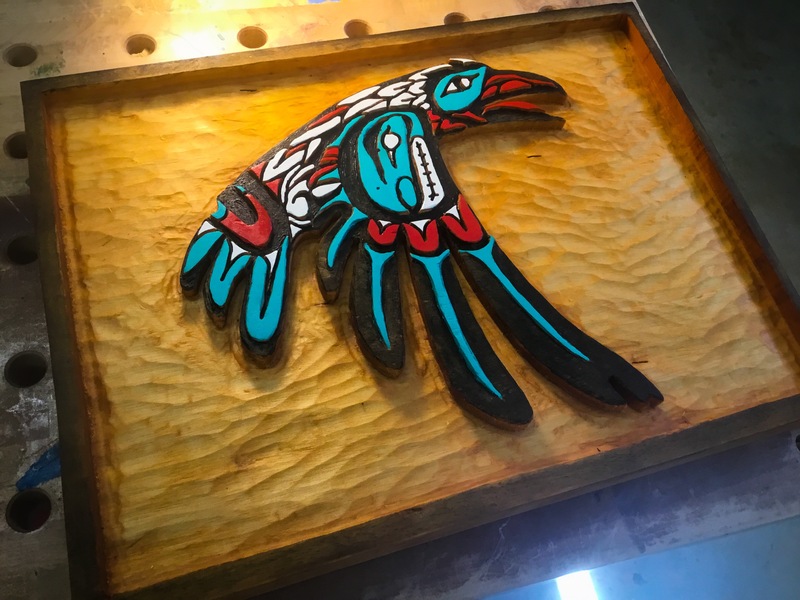 This class is a must for anyone curious about relief carving, we would only recommend Raymond! 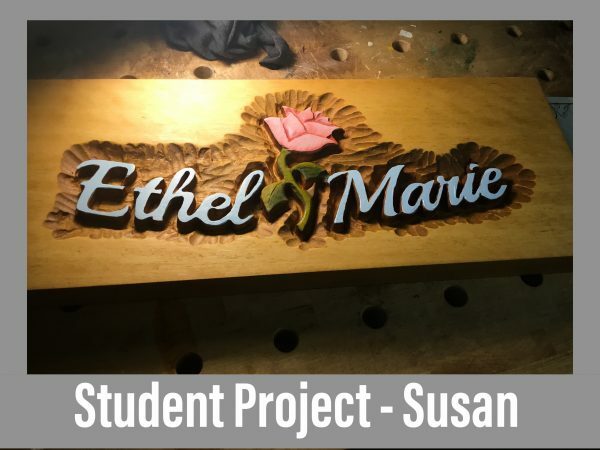 To be able to learn the craft of relief carving from one of the masters was a once in a lifetime experience. 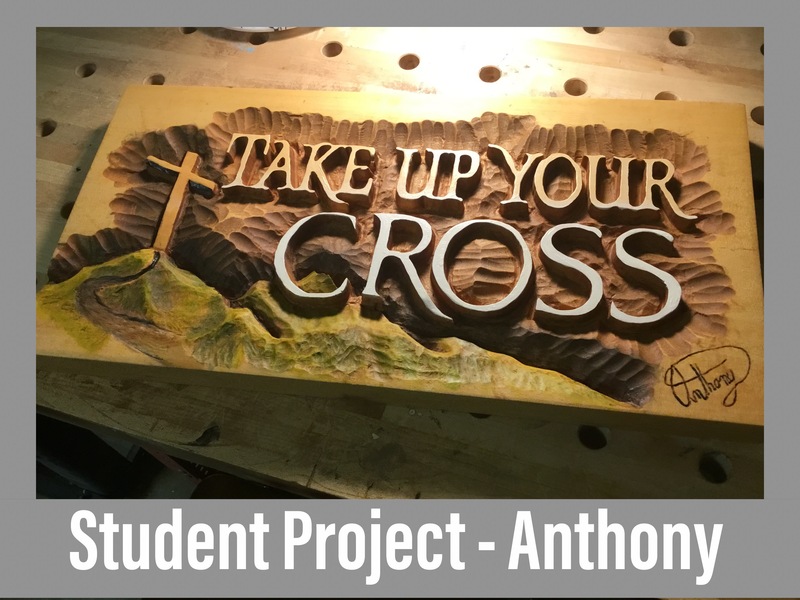 Raymond’s ability to teach and instill in us the confidence to be able to design and create such a beautiful relief carving was so exciting!! I now have the knowledge and confidence to further explore this wonderful art form. 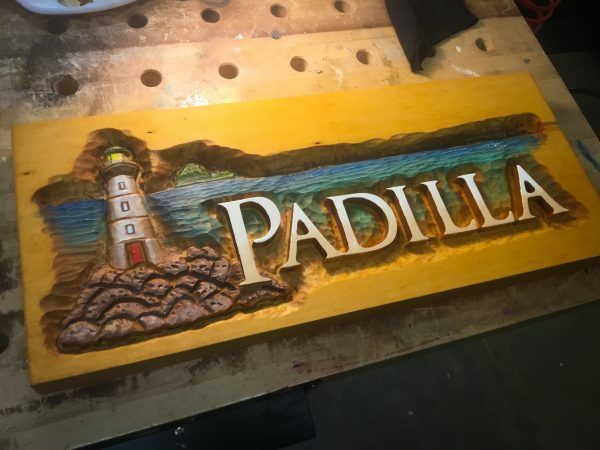 After each retreat day I couldn’t wait for the next class to continue to learn Raymond’s relief carving method along with the tips he has learned from years of experience. 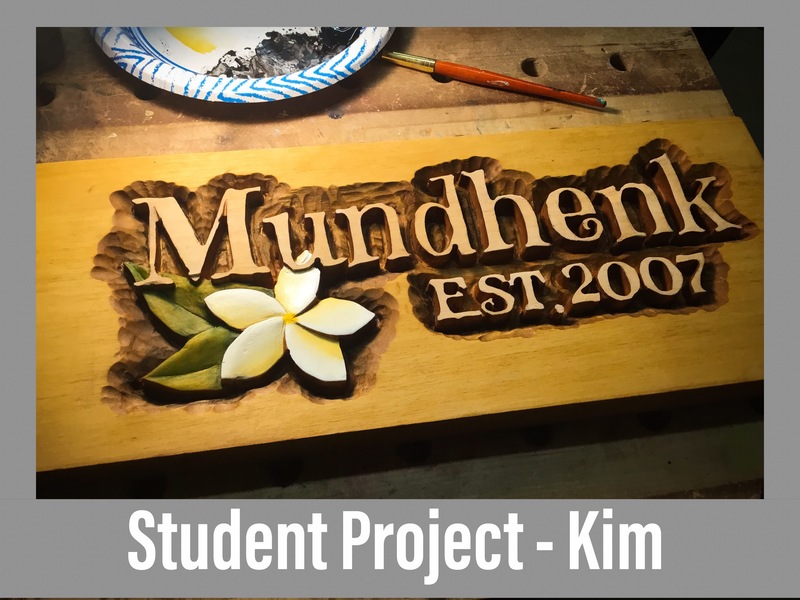 Since I completed the retreat, friends and family couldn’t believe how creative and beautiful the relief carved sign looked!! I can’t thank Raymond enough for taking time to teach and guide us, with allot of one-on-one time, throughout the retreat. He provides professional tools and supplies. Also encourages you to take pictures, throughout the carving process, of your project, tools and products. 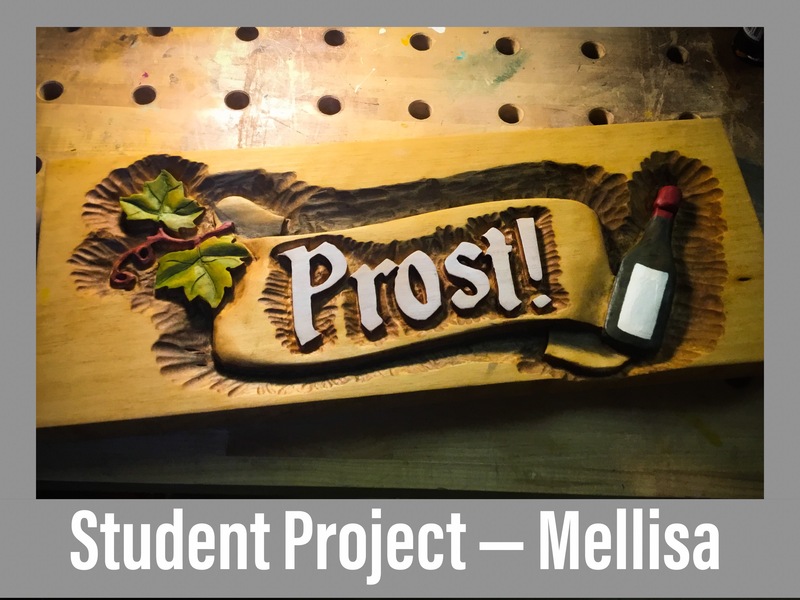 This was my first wood carving experience and now I am already planning my next wood carving project. Each class member designs their own sign, with Raymond’s guidance, which allows you to learn additional carving/painting methods, that may not apply to your sign, as Raymond demonstrates different techniques to the whole class. 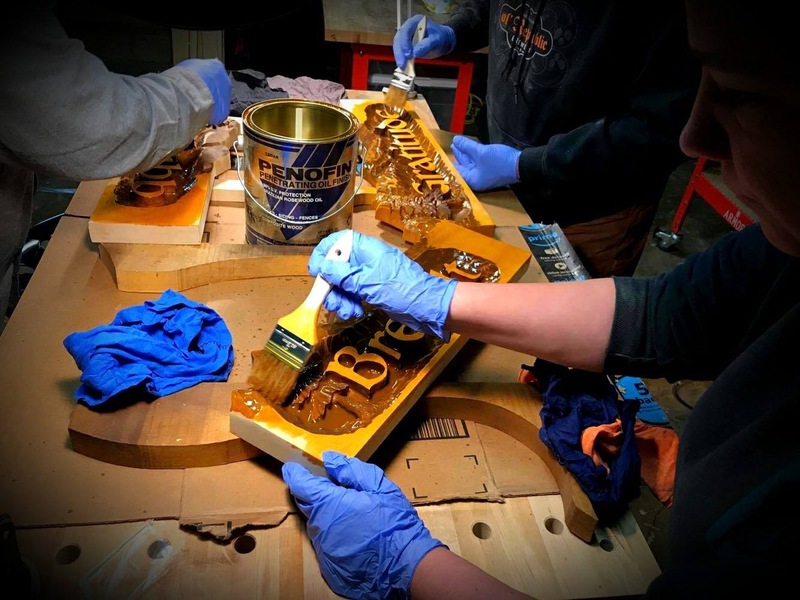 The student “hands on” approach Raymond takes really reinforces the skills you are taught by allowing you to perform those skills on your project. 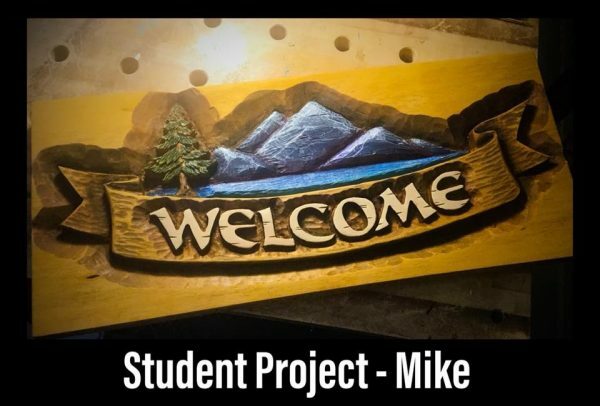 I had a great time meeting the other class members during our journey into wood carving. This retreat really exceeded my expectations. Thanks again Raymond for your time, knowledge and hospitality. I really, really enjoyed this retreat and was stunned at what everyone accomplished. Ray’s an unparalleled teacher, and proved it every day. All of us were able to create our own design under his tutelage. I learned so many techniques, I could practice for years! This is a great retreat.. I would recommend it highly to anyone who wants to learn.. you’ll be shocked what you can create! This was an amazing experience. The feeling I got from sculpting a bare piece of wood into such an astonishing piece of art was such a healing experience. These were not my expectations when we started. The first thing that came to mind was I don’t have the artistic skills to make something so beautiful. I can draw stick figures and that’s about it. I can paint a house not a portrait. I turned out to be very wrong. The atmosphere of the working space was warm even in the bitter cold of the beautiful outdoor setting. After the first day of working with the wood carving , when taking a break outside I looked at the surrounding trees differently. There was a connection to the trees that I could not explain and it was peaceful. Raymond and his wife took very good care of us the entire weekend. Thank you both so much. I would recommend this class to anyone that may enjoy a little peace in their busy life. 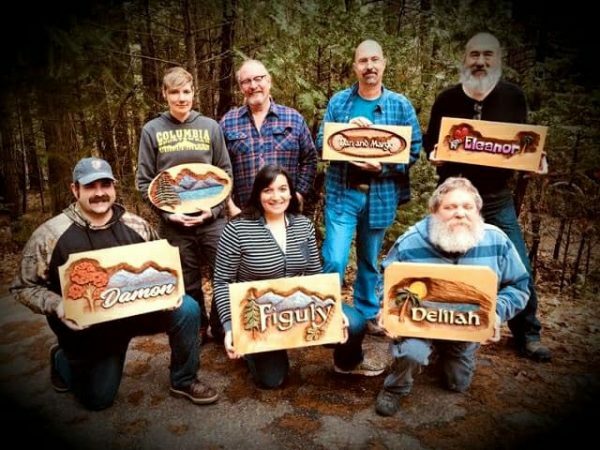 To say you just did a wood carving class eould be a huge understatement. 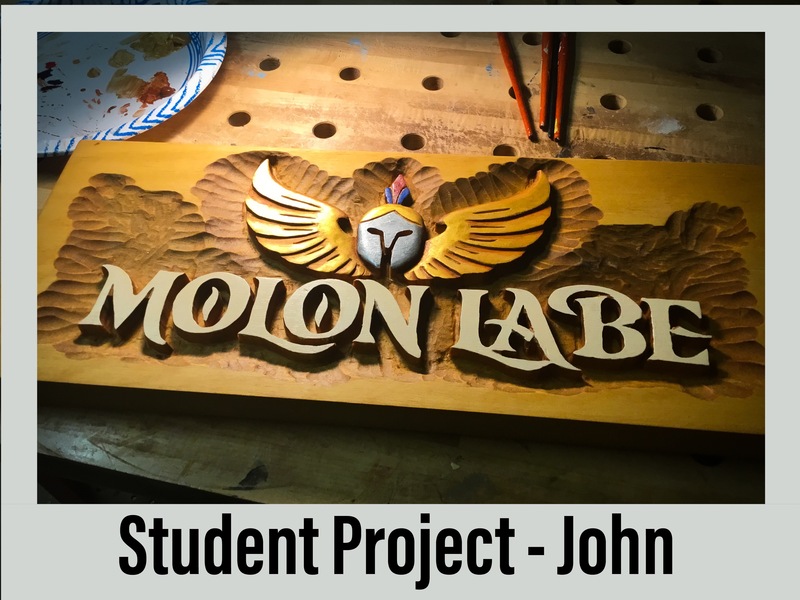 Ray took a rough rugged artless talent and turned me into a wood carving artist. From the moment you get there his home is your home he makes you feel like you’re family. He explains how easy the whole Proess is and all you can’t think is “yeah right” I don’t have a artistic bone In my body. Then you start and the picture you have chosen to draw starts to take life. From there you realize that the little dormant seed that has hidden so well in you starts to grow. The farther you get along in the process the more that seed turns into a tree of life and your carving has Come to life right in front of your very eyes. Now you might say I’m crazy for all this and it’s just wood and a little paint but for me it changed my life. If I could be here every weekend learning from Ray, I would. This man has a true calling and is truly blessed with a God given talent that he is sharing with the world. If you have the resources To do this experience wth Ray don’t walk or wait, you need to run to the opportunity. I am a changed man and I can’t wait to start more carvings and trying new things that I never would have thought was possible to do. Ray thank you for one of the most amazing weekends of my life. You’re a true groundbreaker and life shaker, I pray that God blesses your home and everyone you come in contact with. Quit procrastinating and get on the wait list for an upcoming class. This is a once in a lifetime opportunity to learn from an amazing, master woodcarver. 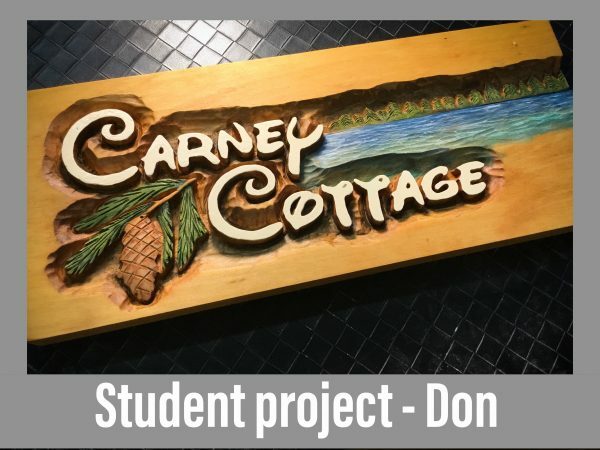 You spend a weekend in a friendly, collaborative environment and come away with a fantastic project and some serious new skills. No talent or creativity required. Ray has a real gift as a teacher, as he infuses the air around you with passion, confidence and ease. I was extremely nervous on Friday night, not knowing how I could possibly create any sort of “art” by noon on Sunday. Yet hour by hour, Ray’s enthusiasm in our work and personal assistance erased all worries and it became a true artistic retreat. I left dreaming of my next project right away! Don’t think twice about signing up for a class… your only regret will be that you didn’t do it sooner! Thank you Ray for sharing your time and passion and skills with us! Wow! From minute one to end, Ray gently guided us through 3 intense and fulfilling days of artistic exploring. I was able to turn a blank piece of wood into a personal work of art that speaks to me. His guidance, his suggestions all tempered with, “Would you like to know what I’m thinking? But it’s not my carving, it’s yours. What Do You Think?” A consummate Master Teacher and Carver! I’m proud of what I accomplished this weekend! Thank you, Ray! Raymond says that woodcarving is easier than it looks once you know how. I agree. He is a very good, very patient teacher. From layout to finished product he helps a lot with individualized attention. Finished product is beautiful. Ray thanks for the opportunity to learn from you! You did a great job of guiding 6 neophytes through their first venture into woodcarving. 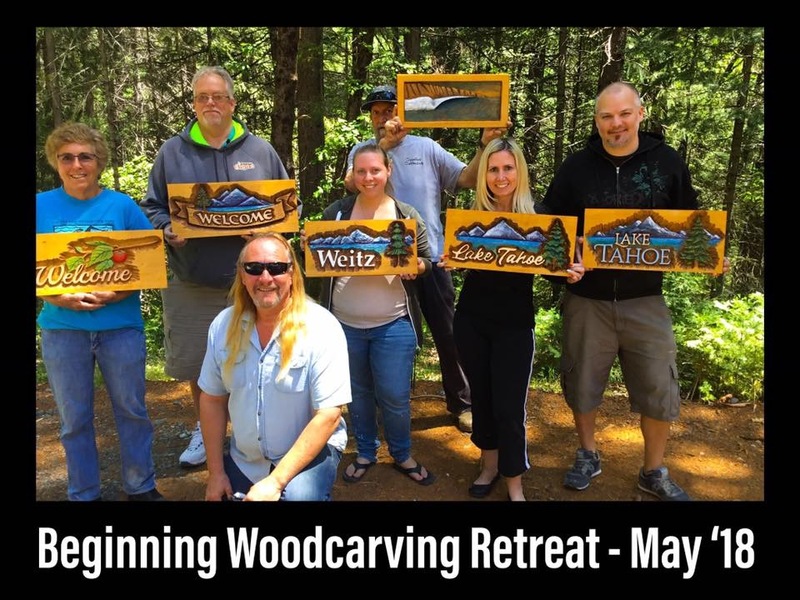 You took an eclectic mix of people, with no prior experience, and over the course of three days of intense learning and through your guidance we all seemed to not only learn but excell in the art of woodcarving. If you aren’t an artist or don’t have any experience carving like me, don’t worry! Ray is an outstanding teacher & made the entire process incredibly easy & fun to follow. I shaved YEARS off of my learning curve by attending his retreat. Ray & his wife Marisa are some of the kindest, most genuine people I’ve ever met. They were incredibly welcoming & I felt so comfortable in their home & workshop. 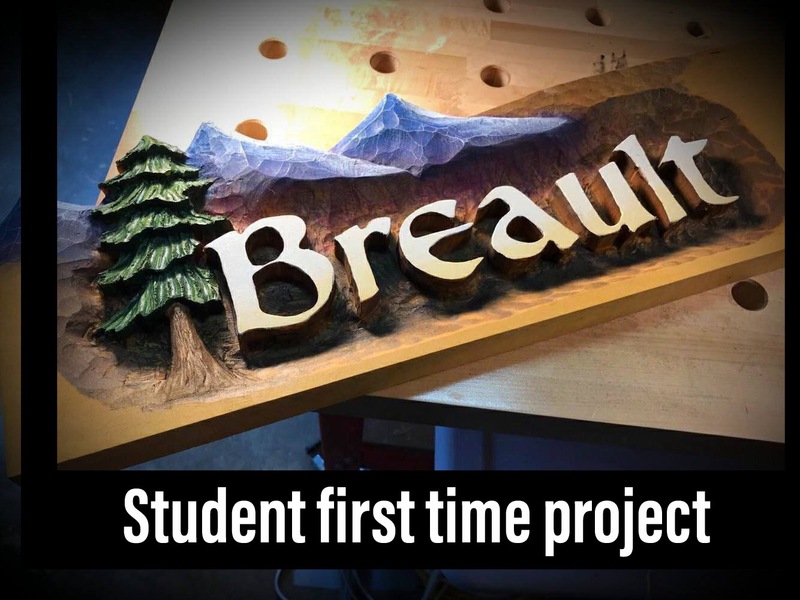 This woodworking treat was one of the best experiences of my life, I highly recommend it!! My daughter; Katherine and I have been following Ray’s Facebook page for a couple of years. We had the privilege to attend his woodworking retreat this past weekend. When we arrived, we were welcomed into their home as friends. We already had an idea of what elements we wanted in our projects. 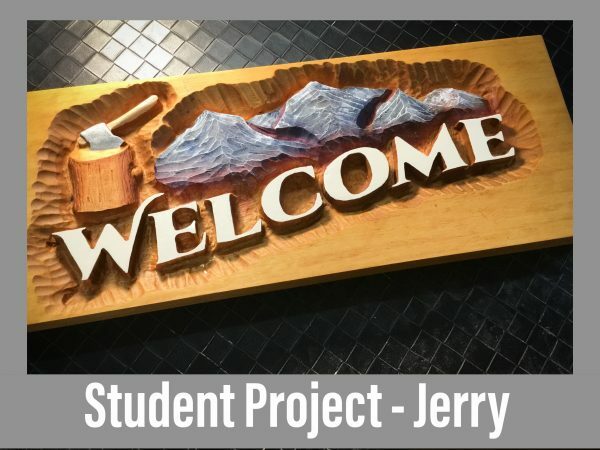 Ray helped each student make a design and guided each of the six students through every step. We never felt lost or alone. Ray was incredibly helpful and insightful when it came to teaching us his process. It’s amazing how he can take a seemingly daunting task for a non-artist and make it a wonderful and exciting exploration of the craft. I cannot recommend this course enough. It is an absolutely wonderful experience that I will hold onto for a lifetime. 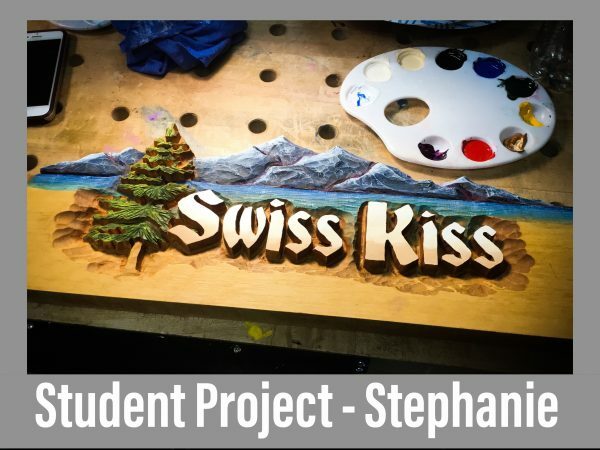 Ray’s talent as an artist and as a teacher, truly is a gift to everyone that crosses his path. Ray is able to draw incredible beauty from each student, without them having had any prior experience. His patience honors each student and gives the student a once in a lifetime experience. I cannot wait to continue carving and to hopefully take more classes it’s Ray! The retreat was a wonderful experience, Ray and Marisa make you feel as if you were longtime friends. The class was small, just five of us, and we learned so much and had such a wonderful time. Over the course of the weekend, Ray was able to take us step-by-step until we had made our own personal “masterpiece”. It was something I could have never done on my own or would have even tried. Ray is an excellent teacher, his insight is amazing. We would ask how to do this or that and he would guide you through and you felt like you were doing it together, not just him telling you what to do. In the end, you felt amazed that you actually did what you did. I can’t wait to try woodcarving at home.